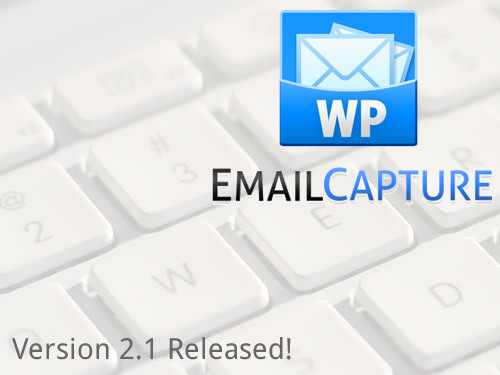 WP Email Capture 2.1 Released! Last night I released the latest version of WP Email Capture. For those of you who know anything about me before starting Blogging Dojo, I did used to meddle around with WordPress Plugins before the release of Author Plus. One of my most successful was WP Email Capture, a plugin that allows you to collect email addresses the second you start a blog. Anyway, I neglected it for a bit whilst I worked on other projects, however recently I was contacted by a plugin developer who needed French integration to the plugin, and together we made the plugin i18n compatible (the standard for internationalisation). I also have made a website, twitter account & facebook page associated with it (it will likely be my next paid plugin), so get following those! To download WP Email Capture 2.1, visit either the official site or the WordPress.org page.